Wellman Sport is an advanced, specialist supplement developed specifically for men training to excel in sports and fitness from Wellman, the UK's number 1 men's supplement brand. The comprehensive formula helps to maintain optimum levels of nutrition and contains valuable nutrients which can support performance during sport and training. Wellman Sport is not a weight or muscle gain product; it provides all round, balanced multivitamin support that can be taken every day. Take 1 tablet per day with your main meal. Swallow with a glass of water or a cold drink. Octacosanol, L-Tyrosine, L-Arginine, L-Lysine, Alpha Lipoic Acid, L-Carnitine Tartrate, Co-enzyme Q10, Natural Mixed Carotenoids, Siberian Ginseng Extract, Citrus Bioflavonoids, Vitamin A, Vitamin D, Vitamin E, Vitamin C, Thiamin (Vitamin B1), Riboflavin (Vitamin B2), Niacin (Vitamin B3), Vitamin B6, Folacin (Folic Acid), Vitamin B12, Biotin, Pantothenic Acid, Iron, Magnesium, Zinc, Iodine, Maganese, Copper. No artificial colours, gluten, preservatives, salt or yeast. Suitable for vegetarians. Not to be chewed. Do not exceed recommended intake. 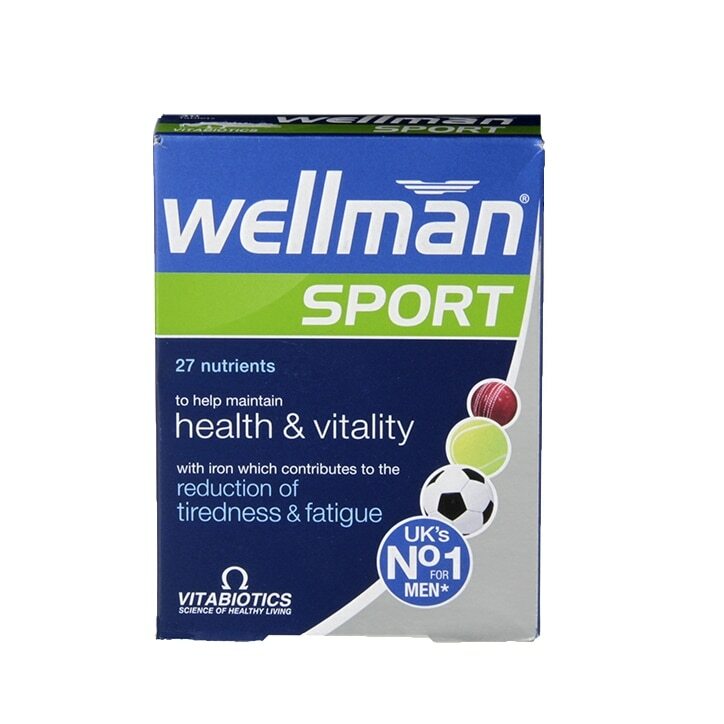 Vitabiotics Wellman Sport Tablets is rated 4.6 out of 5 by 9. Rated 4 out of 5 by Iain4535 from Would buy it again I bought this item last week and I am very satisfied.